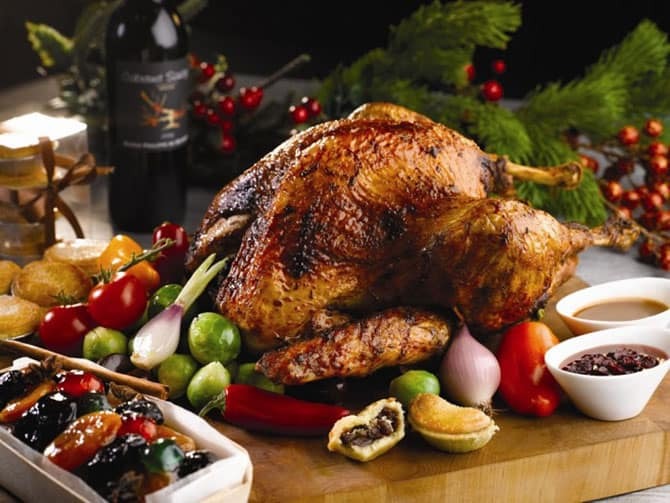 Baked Turkey is one of the dishes that cannot be missed during Christmas. It is actually healthier as compared to other meat choices like beef and ham, containing less cholesterol and saturated fat. Not only that; it is also rich in tryptophan, an essential amino acid that helps your body to produce vitamin B. Reducing the amount of sauce to go with it helps to cut down cholesterol and saturated fat intake, lowering the possibility of getting heart related diseases. Next in line would be the Pumpkin Pie. Pumpkin itself contains a high level of beta-carotene – gets converted into vitamin A in the body, along with vitamin C and Potassium. Potassium helps in maintaining a balanced level of sodium within your body, and reduces the effect of sodium if you have high blood pressure. A bowl of nuts would be ideal to accompany you and your friends during your chat sessions. Out of the many varieties to choose from, walnuts would be our recommendation. Containing unsaturated fats that help to lower cholesterol, it also possesses the highest amount of omega-3 among all nuts. On top of that, they are rich in fibre, vitamin B, magnesium, and vitamin E (anti-oxidant). Walnuts generally help to strengthen our blood vessels’ elasticity and reduce plaque accumulation – culprits of heart related dieases. Nevertheless, whichever the types of nuts consumed, moderation is the key, as the high fat content can do significant harm to the cholesterol profile if taken in large quantities. We understand the need to drink during Christmas. However, if you go overboard, it not only affects your liver but also your heart, with effects like stiff arteries and rigid heart muscles (see How Alcohol Gives Your Heart a Beating). You may consider alternatives like green tea, containing L-theanine, which calms the brain, reduces stress and helps in boosting immunity. Fruit Cake, a traditional delicacy during Christmas, should be taken in bite-sized amounts . Know that it contains a heavy load of sugar, with its stuffed sweet candies soaked in high sugar content syrup. It will not only increase your Low-density Lipoprotein (LDL) and Triglyceride (TG) levels a.k.a. bad cholesterol, but also decrease your High-density Lipoprotein (HDL). (HDL helps to remove cholesterol within your arteries, transporting it back to the liver to be excreted or reused.) Alternatively, you could try cakes that include fresh fruits like berries, peach or even banana that are not soaked in any form of sugary syrup. While enjoying this festive season, do not forget that everything should still be consumed in moderation. It might seem insignificant but a small step like this helps to contribute to a bigger better future; not just for your sake but your loved ones who want only the best for you in life.